MatsClock-1045 is a totally Unique Free Flash Clock. I designed this flash with a difference. I was sitting and watching my mobile phone hang on the harness and swing. My mobile phone is set to show the time on an analog clock. Suddenly, I realised what I was seeing. 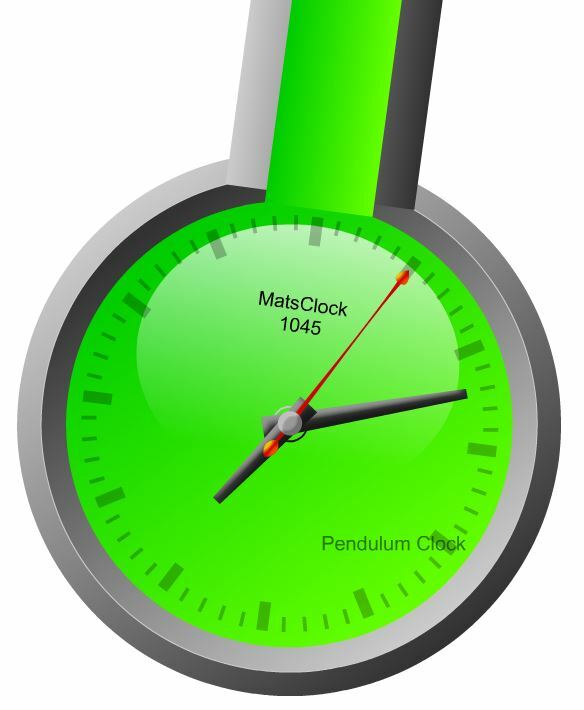 I immediately came to my computer and designed this pendulum clock. I called it a pendulum clock because I found that the clock I was designing was suspended from a pivot and the entire clock was swinging with time without stopping like a pendulum in any grandfather clock. I used the needles from a previous clock, but retained the green dial as it is on my mobile phone back ground the only difference being that my mobile phone has a square dial and my pendulum flash clock has a round dial. Amazingly, the length of the Pendulums in a GrandFather Clock can be changed. Changing the length of the pendulum changes the rate of time. If you reduce the length of the pendulum then the grandfather clock starts speedingup time. In a day you can make it run faster by up to an hour faster. Similarly, increasing the length of the pendulum will make the pendulum swing slower and thus slow down the grandfather clock as well. Slowing down upto one hour per day could be achieved in a grandfather clock by this method. Why Grand Father Clock Pendulums Need To Be Adjusted ? The change in length of the pendulum in a grandfather clock is used to correct the time speeding up or slowing down when the clock is running for a few days. This happens because those days there were no air conditioners. So in summer the metals expand and the length of the pendulum will increase and slow down the pendulum swing and thereby the grandfather clock starts losing time. After a day the clock shows 8 am at 8:03 am or three minutes late. The day after it will be 8:07 or late by four minutes because the clock spring which you had wound tight also loses some tension as the steel strip spring also elongates in summer. Thus the pendulum length increase and spring length increase both contributes to slowing down of grandfather clock. The opposite effect was seen in wintes when the temperatures used to drop. The spring lengh shortens and increases the tension in the spring making the pendulum swing faster and the length of the pendulum also reduces and makes the time run even faster. So if you set the correct time at 8 am, tomorrow you will find the clock showing 8 am at 7:55 am and day after its needles may show 8 am at 7:48 am. Thus adjusting the pendulum with hit and trial method was required over a few days till it starts showing correct time every day. The pendulum lengh could compensate for both the spring tension and pendulum length induced time changes. How To Adjust Pendulum Lenght In GrandFather Clock ? The grandfather clock pendulum used to be made with a single rod of hollow material with a rotable screw on the bottom which can ride up or down. The pendulum was big flat disk kept in position by this screw. When you rotate the screw up, the pendulum heavy disk rides up and so does the center of gravity of the pendulum and thus the effective length of the pendulum because the pendulum swinging time depends on the piviot of swing and the cener of gravity position from the pivot. Today you may not need to do adjustments on the pendulum even if you have a grandfather clock which is placed inside an aircondition room. But I am sure no one in the world would have ever got this idea to make a clock swing like a pendulum or rather build a clock inside a pendulum. As usual you can highlight the Pendulum Clock written in the dial and type in any text you want. To help you type in the text I did not make the text swing with the pendulum. But since the pendulum clock itself is swinging behind the text, the clock text also looks to be swinging in the opposite direction. You can download this free flash clock and use it on your computer, blogs, websites or your powerpoint presentations absolutely free.